This was supposed to be a post about an App-O-Rama but we decided to call it quits after just two applications so there’s really nothing to say there. 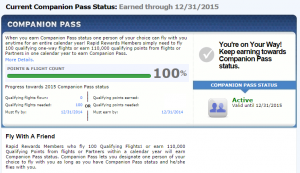 If you’re looking to earn a Southwest Companion pass for 2015 and 2016 though, you might want to go ahead and get started. Nope, it’s not too early! is the Swiss Army Knife of domestic family travel tools. It’s that good. You probably know all of this, but if you aren’t familiar with the Companion Pass here’s the short version: earn 110K points in a calendar year and another family member (or whoever you designate as your companion) gets to travel for free (zero points plus taxes) on any flight along with you. Regardless of how or when your ticket was booked, right up to the very last seat available. Those points can be earned in any way or transferred from hotel programs. Points transferred from Chase Ultimate rewards don’t count toward the Pass. The answer to just about every other question is: Yes, you can do that. We’ve also written more on Southwest in general and Southwest as a positioning tool. Check those posts out if any of this is new to you. is the easiest path for most people. You can open a personal card and a business card when the bonuses are at 50K, put $10,000 spending total on them, and you’re good to go. Like most signup bonus offers, the Chase Southwest cards require $2000 in spending within 3 months to get the bonus, but the rest of the spending can be done at your leisure, just make sure you get it done so that all 110K post within the one calendar year. Or earn some of those points with shopping portals, those count too. Yes, it is. 3 months from now will still be 2014, and we need the points in 2015 to get 2 years out of our Pass. However, points post from Chase to Southwest with an effective date of your statement closing date. So when Bonnie’s new card is activated, the first thing we’ll do is change the statement date to the 5th of each month. Or somewhere around there. That way we can make a couple of small purchases between now and December 5th and then $2000 or so a day or two AFTER the December statement posts. THIS IS VERY IMPORTANT, PLEASE DON’T SCREW IT UP! Then when the following statement posts in January, she will have 52,000 points earned in 2015 toward her new Pass. We have a trip booked for February 2015 but Bonnie’s pass expires at the end of 2014. Since Southwest has the perfect cancellation policy, we went ahead and booked 3 tickets knowing we can cancel the third one and rebook it with the Companion Pass right up to just before travel. The fourth ticket is already booked with my Pass. If we’re going to use another credit card (the Southwest Business Premier card) for the other half of the miles, we’d like to wait 60-90 days between the two Chase applications to give her the best chance of approval. By going ahead and getting the first one early, we can space out the applications and still get the Pass in time for our February travel. but many people who currently have the Plus or Premier personal cards have referral links that gives you 50K and them 5K. You can find some of those referral offers including the Plus version with the lower $69 annual fee in this Flyertalk thread, but we used Points With a Crew’s link. He’s got 8 travelers – I don’t know of anyone else with a bigger need for Southwest points! Update: Dan from Points with a Crew let me know via Twitter that he has gotten the max of 50K referral points, so you might as well use someone else’s link if you want to help another family out. There is also a 50K Premier card link here that is not a referral offer. None of these pay or give me anything. I fully expect the business card offers (all four cards actually) to go back to 50K sometime before the end of the year. I had plans to do at least a couple more but decided to stop based on the results of the first two: The Southwest Premier card was instantly approved but with a low credit limit. Score! While that was processing, we applied for a Bank of America Alaska Airline card with 25K bonus miles and a $100 statement credit. We had reduced the credit line on Bonnie’s existing Alaska card by some $9000 hoping to avoid the BofA bait and switch but this application was not instantly approved. It is pending, but Bonnie is not a fan (to say the least) of reconsideration calls. Or any phone calls for that matter, so we’ll just wait and see what comes in the mail. With the low CL offered by Chase, we didn’t want to clutter her score or report with any more applications or new accounts since we’ll likely be asking Chase for another card in a couple months. Getting the cards that will do the most for your family is a lot more important than getting every single offer out there! With that in mind, we will lay low (for us) until we have the points secured for what we know we can use (the Companion Pass) before reverting to opportunistic hoarder mode. Disclosure: If you apply and get approved for one of the credit cards referred to in this post, we get nothing. But if you pay interest on it, ever, we will be very sad. You made it this far, please read this excellent post by Loyalty Lobby on credit card marketing and real risk. Thanks for the tip in the tip jar! Because there are 8 of us, I’m not sure that it pays to get 2 companion passes at the same time for us. Right now my wife is my companion, and we have used that several times for getaway trips with just the 2 of us. You’re welcome! You can switch your companion 3 times, so you might be able to bounce back and forth and get the best of both worlds. But yeah, travel with and without kids does throw a wrinkle in the multiple pass strategy. Can you get the SW Plus and Premier at the same time? Yes, you can get and/or have both at the same time. Your chances may be better at the same time, or a few months apart, depending on how many other apps you have, your history with Chase, etc. So if you get it in 2015 then it lasts thru 2016? If you are going to spend $2K per DAY on your wife’s card, do you prepay your CC or do you pay weekly or every 3-4 days? Sorry if that wasn’t clear. Just one 2K day immediately after the December statement posts to trigger the bonus in January. The other 5K-8K (if using 2 cards for the Pass) can be done over the rest of the month for a Pass in January, or at a slower pace if the Pass isn’t needed until later. In any case we generally pay off weekly if needed to free up credit. Great post. We have two companion passes, earned with the Rapid rewards shopping portal madness. Works great to help move our family of 9 around. 9, I think you win! I grew up doing road trips in a family of 9, great times. – You get the card now & activated in a few days..so it’ll be early Oct. You call & have closing date changed to 5th of each month..so it’ll be starting Oct 5.
any points for purchases after Dec 5 will post to account on Jan 5, thereby counting toward 2015/16 Companion pass? We applied last week, and the 3-month calendar starts upon approval not activation. So we have to have the charges post within 3 months of that date. Chase can tell you exactly how long that ‘3 months’ is; the last time I inquired on a Chase card application they told me I had 103 days from approval. So charges made December 6th or 8th or whatever will definitely be within 3 months. Since the first statement date will likely be set at October 20 or so, a request to change the statement date will result in the second statement closing December 5. But again, you have 3 months, not a certain number of billing cycles. As long as we get charges done within the required time frame but don’t cross $2000 early enough to trigger the bonus on December’s statement, we are good to go. Actually Chase usually does not post the bonus until the following month if you meet the spending requirement during the last 5 days of the statement period, but that’s not worth risking. So I understand the reason for changing the statement date…it’s to delay the date so that the 3rd statement doesnt post until Jan 2015? The only thing that matters is making sure we get the spending done after the December statement AND before the 3 months is up. The number of statements or billing periods is irrelevant. And this will be 1 card. Then we’re assuming the offers will roll around again early in 2015, so can apply for the 2nd card. This will also give 3 months time b/w applications.? Do you know if one can get the CP by getting 2 Personal cards (Personal Plus & Personal Premier)? Or does 1 have to personal, and the other business? I’ve read people posting they got CP with both Personal, then also saw someone saying SW Terms state bonus is for 1st Personal card & 1st Business card, and that the bonus would be given for 2nd Personal card. Correct, this gets us the first 52K. We will then need 58K more to post in 2015 from another card (Business Premier in this case since she already had both Plus cards in early 2013), or from shopping portal points. 3 months between applications would be ideal but it may wind up being just 2 months as the 50K offers will probably come back for holiday shopping. Another possibility would be 28K via shopping portals and the rest transferred from 50K Chase UR to Hyatt and from there to 30K Southwest. I hate to lose points during transfers like that, but it would double the value of all 110K points. As long as the two personal cards are the two different versions AND you haven’t gotten a signup bonus on either for at least 24 months, you can use two personal cards. The terms you refer to exist only in someone’s imagination, and all terms regarding bonuses are from Chase, not Southwest.